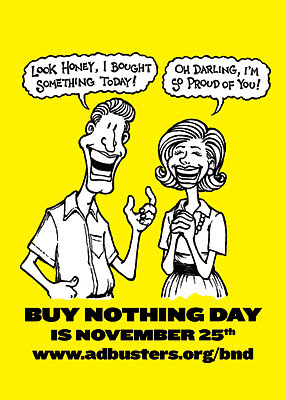 You have been bombarded by ads to buy Buy BUY EVERYTHING this Friday. Black Friday. So called because of the traffic it generates. I challenge you to do the opposite. 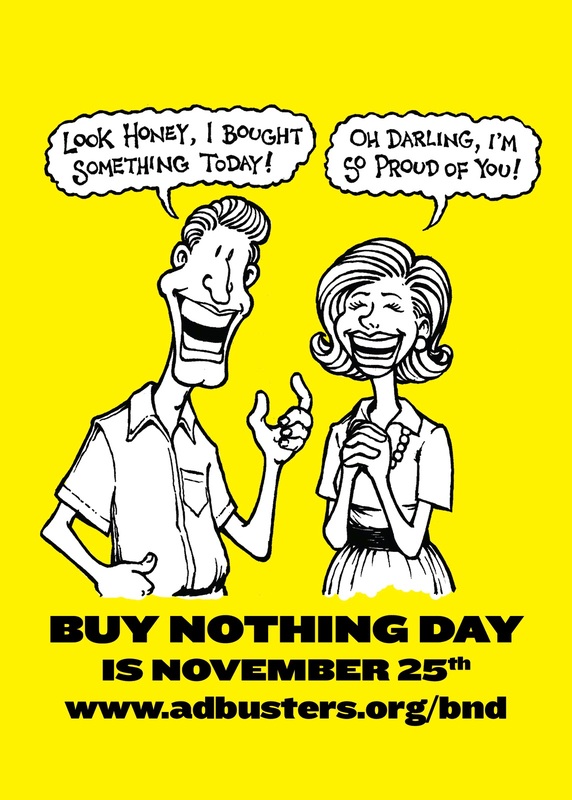 Instead, buy nothing. Avoid that traffic. Avoid the light year-lines around your local big-box stores. Avoid the gas station. Avoid the grocery store by eating some of those leftovers. You don't need to be a hermit, but you don't need the hassle either. For what? So you can stand in line for hours and watch the two old ladies in front of you, who were sharing pictures of their grandchildren earlier, come to blows over $300 TVs while you leave the store with a bunch of stuff you didn't know you needed in the first place? It's not worth it. Instead, relax. Do you have the day off work? Relaxation should come easier. Get outside and take a walk. Down to the corner, around the block, around town. Find some fresh air away from the Black Friday horde. Maybe walk around in your snowboard boots. They could use some breaking in. Sit down with a book. Maybe something you've been trying to make time for. Watch an old snowboard movie or another movie that you haven't watched in sooo long. Call the friends and family you didn't talk to on Thanksgiving. Tell them why you're thankful for them. Give thanks to snowboarding. 'Friend' Thanks Snowboarding on Facebook and follow Thanks_Project on Twitter. Stretch. Exercise. The snow is coming. Be ready. Shredding will make you happier than any doodad you can buy anyway.